Flex not only offers the utility and practicality that crossover SUV shoppers are looking for, but also a one-of-a-kind, station-wagon-like appearance that really distinguishes it from all other competitors in its field. This year, those who want to purchase a 2016 Ford Flex in the Phoenix area can look forward to some notable updates. The crossover not only gains vivid new paint colors, including Kona Blue, Too Good to Be Blue and Shadow Black, but also arrives with a rearview camera standard on all models (SE, SEL and Limited). Previously, the backup camera was only offered in an optional equipment group for the SEL and came standard only on the Limited. Now shoppers can take advantage of its safety-enhancing ability no matter the selected trim level. Also this year, 2016 Ford Flex reviews have been talking about the crossover's first-ever appearance package, which includes sleek 20-inch rims and a black liftgate applique, grill, roof and door handles, which give Flex a bolder, more signature look. 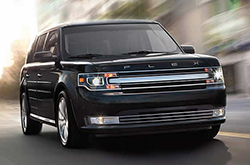 In addition, when you come check out the 2016 Ford Flex in Surprise, you'll get to try out the new SYNC 3 infotainment interface, which is offered on upper trim levels. The system is distinguished from its predecessor by its enhanced voice and touch control technology, faster performance and simplified menu. 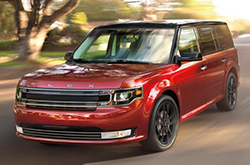 Aside from this year's changes, 2016 Ford Flex reviews say shoppers will be pleased by the features and engines that carry over from last year. Standard on the base model you'll find amenities such as a basic version of the SYNC system, Bluetooth Hands-Free Phone and Audio Streaming, rear parking sensors, an auto-dimming rearview mirror, keypad entry, automatic headlights and much more. Under the hood, the standard engine on every 2016 Ford Flex in Surprise is a 3.5-liter V6 that's rated at 287 horsepower and 254 pound-feet of torque. Optional on the Flex Limited is a turbocharged EcoBoost V6 that cranks out 365 horses and 350 pound-feet of torque. 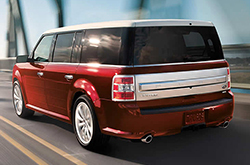 Want to know even more about the Ford Flex? If so, scroll down below to find more vehicle specs, in addition to a comparison tool, video and inventory links. When you compare Ford's new 2016 Flex alongside the 2016 Buick Enclave, Honda Odyssey, Dodge Durango and the Chevrolet Tahoe, we're sure you'll find that the Flex is perfect for you. The Flex's pronounced looks, useful onboard technologies and bargain MSRP are sure to win over AZ shoppers. You'll clearly see that when compared to the competition it's a fantastic value in regard to price, which is why many Surprise Ford customers choose it. For more info, check out the Flex's quick-facts list under this paragraph. The Ford Flex review above, along with overviews of earlier models and other 2016 Fords, will help make finding your next car a breeze. Good reviews are hard to find ; but as the well&$45;respected Ford dealership in Surprise we've put it all in one location for you. Information you can count on to make wise decisions is right here - each summary is filled with beneficial information and specs. Is the Flex not the right pick for you? Discover more about other vehicles on the lot at Surprise Ford using our reviews index. With it you can review and compare Ford's entire series of vehicles.